The economic toll of the opioid crisis is estimated to have topped $1 trillion from 2001 through 2017, a new report says. The economic fallout from the epidemic of heroin and prescription painkiller abuse is on track to cost $500 billion from 2018 to 2020 alone. More than 62,000 Americans are believed to have fatally overdosed from opioids in 2017. Over 100 drug reform advocates, former addicts, and family members who have lost loved ones to drugs participate in a New Orleans-style funeral march to demand action on Overdose Awareness Day on August 31, 2017 in New York City. The economic cost of the growing opioid epidemic topped an estimated $1 trillion from 2001 through 2017, according to an analysis released Tuesday. And the opioid crisis is projected to cost the United States an extra $500 billion through 2020 unless sustained action is taken to stem the tide, the report from health research and consulting institute Altarum said. That's because in recent years the growth rate in the economic fallout from the epidemic has sharply accelerated, along with the number of overdose deaths related to prescription painkillers and heroin. Altarum said "the greatest cost" identified in its analysis "comes from lost earnings and productivity from overdose deaths — estimated at $800,000 per person based on an average age of 41 among overdose victims." The number of fatal opioid-related ODs is estimated to have topped 62,500 last year. The analysis also estimated the costs from lost tax revenue to state and local governments, additional spending on health care, social services, education and criminal justice. Health-care costs alone related to the crisis reached $217.5 billion from 2001 to 2017, according to the report. 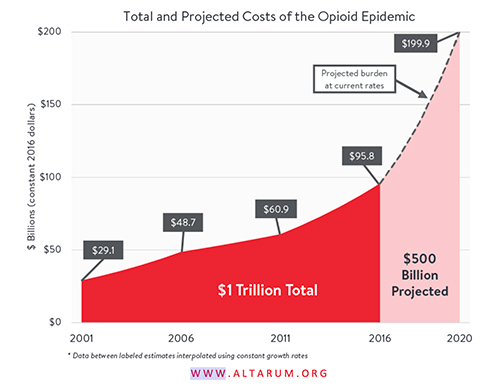 Altarum estimated that in 2001, the nation's annual cost from the opioid crisis stood at $29.1 billion. That more than doubled to $60.9 billion in 2011, and then hit a whopping $115 billion in 2017. "The growth rate between 2011 and 2016 was double the rate observed between the previous five years," the report said. President Donald Trump, in a budget proposal released Monday, called for $17 billion in opioid-related spending. Of that, $13 billion is proposed for the Health and Human Services Department to use "to combat the opioid epidemic by expanding access to prevention, treatment and recovery support services, as well as support for mental health."